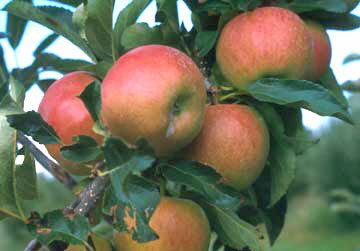 Kidd’s Orange Red × Golden Delicious, raised by J. H. Kidd, Greytown, Wairarapa, New Zealand, about 1934. Moderate vigour, upright, fairly spreading, spurs freely. Susceptible to scab, mildew and fireblight. Medium, 600 hours; red strains similar. Golden Delicious, Delicious, Granny Smith, Jonathan, Fuji; red strains flower at same time but do not cross-pollinate each other. Tall conical, size can be small; needs care with thinning. Solid orange-red on 50% of surface. Creamy flesh, firm, crisp, sweet and juicy with flavour, excellent texture and eating quality. About a week before Jonathan, third to fourth week February. Keeps quite well; no bitter pit, scald or breakdown. Imperial Gala - Sport, New Zealand. Patented by Flemings. Outstanding bright red with significant stripe;yellow to creamy flesh, finely textured, firm crisp, juicy; excellent flavour. Regal Gala - Sport, W. Fulford, Hastings, New Zealand. Patented by Flemings. 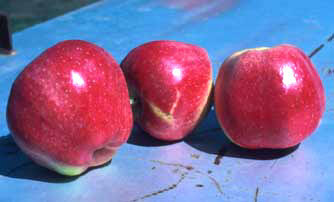 80–90% solid red;creamy white flesh, crisp and juicy, flavour good; not as distinctive as other striped Galas. Royal Gala - Sport of Tenroy, Greyton, New Zealand. Patented by ANFIC. Medium round,bright red stripe overall, very attractive; creamy, fine-textured flesh, crisp, sweet and juicy. Galaxy - Sport from Royal Gala, appears to be more stable. Patented by ANFIC. Medium round, bright red with distinctive green-yellow stripe; darker than Royal and supposed to have very little reversion; creamy, fine-textured flesh, crisp, sweet and juicy.